Two plain-cased Lone Eagle ads, one with index dial instead of numbers,1935. Well Done Robert! That Goldcraft is looking very much like the Senator of 1935 isn't it? And the Webster...all of whish are 15J. Three ads, all from 1936. The unengraved Commander is from November, the two Hudson ads are from October, but are from different newspapers. The difference seems to be the band. 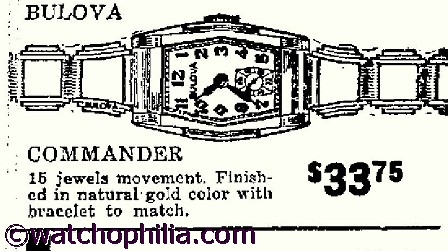 These ads have been posted on Will's unengraved 1937 Commander, but it does not come up in the "recent comments" queue. 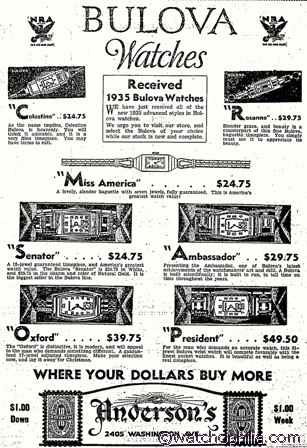 1931 ads courtesy of Lisa from Watchophilia. The "Round The World" watch. The ads tell us it is: "two-tone gold (white and yellow), 15 jewel, dust-proof case, handsomely engraved." Aug 26 1931 ad from the Spokane Daily Chronicle. Some Round The World text, a Lone Eagle. New Lone Eagle model found, from the Oakland Tribune, November 1933. I know it looks like the engraved Trident, but the Trident ads are un-engraved. Also, Will has another, seperate ad from another paper that seems to back this up, and I hope he will post it here soon. August 30, 1932 ad snippet from the San Jose News. Is the Lone Eagle text referring to an unengraved graphic to it's left? Sometimes the advertisers get things wrong. This could have happened in the unengraved "Trident-like" Lone Eagle ad in previous comment. Here's a December 1, 1931 ad snippet from the Reading Eagle Newspaper. It looks like the have a "Sky King" graphic titled "Lone Eagle", yet the text below it goes on to discribe "the Bostonian". Similar issues w/ graphic for the Sky King to the right, but at least it doesn't go on to name it a 3rd model in the discriptive text. The company running the ad is Kays Jewelers- apparently a well established store. You may be able to see the full newspaper ad by clicking on the graphic- if that function works. Looks like the white Banker had a different name. Looks like a new name and jewel count for the President Madison. Interesting Bertram and Tyler (new model). Oh and intersting to note the 21J movements as of 1930. 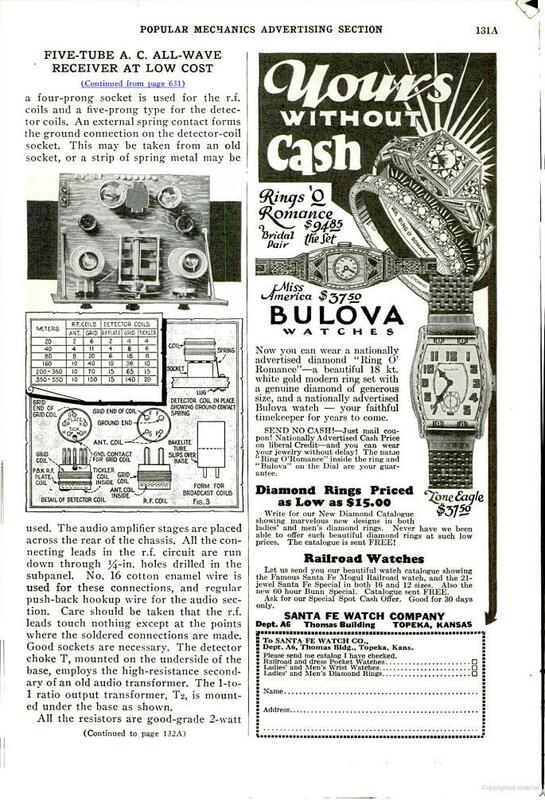 Here are a September 1936, and a March 1938 ads. Both depict the Cavalier, looks like the Commander and I have seen seven or eight ads for this model in four different states. Possibly another "band difference for the name." Above ad is thought to be a mis-print. 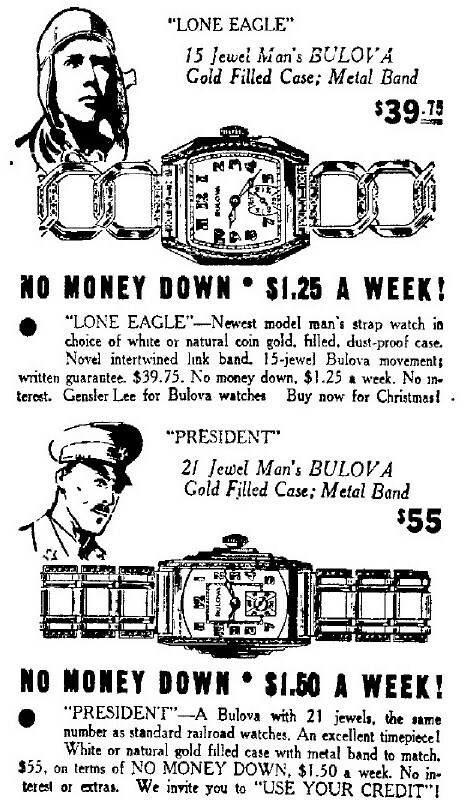 Another ad for this style Lone Eagle, this time from September 1932. Also has the new Apollo confirmation. Do not kill the message bearer! 1931 ad showing a different Miss Liberty. December 18, 1931. Spokane Daily Chronicle. September 1934 ad from Lisa. There is an OXFORD falsely called the Gladiator in the DB, but it does not come to the front of the queue when I try to post on it, so it needs updating. This September 1935 ad should sort out a mistake in one I posted on January 8. The Standish and Ambassador are named for each other in that ad, but this is correct. 1936 ad for the Engineer. 1932 ad. Nice one of the Jump-Hour. Cool a rare Jump Hour advert! 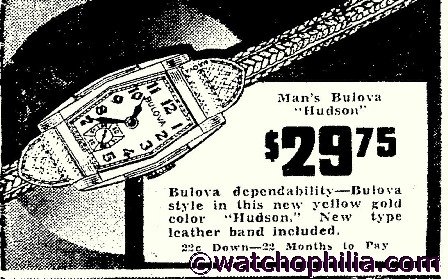 This 1932 ad validates what was a given concerning dial differences, but is now fact. 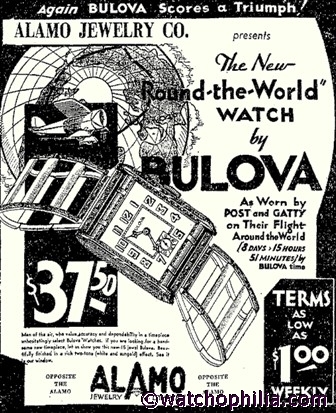 The earliest Calendar watch ad, dated November, 1932. Ad courtesy of Lisa of Watchophilia. Links to relevant threads on this site. A first and rare advert. NICE! Note the LE mark two being advertised after the Mark three release date? Kinda supports the theory that shops sold the stock they had, not the watches developed. Also note the new names for the Debutante and Windsor. "Oxford", I also saw the same ad in several other papers of the day. Almost looks like a pre-Physician case. I was trying to get better res on the Oxford posted above, and in the "gladiator" thread in the DB, but couldn'tEDIT:- Whoops, just noticed its the same ad from the same paper buddy! Princeton looks like it could have been the renamed the Lone Eagle in 1934. BAH... FINALLY... I've been looking for an ad for what we've been calling the "engineer" for years! 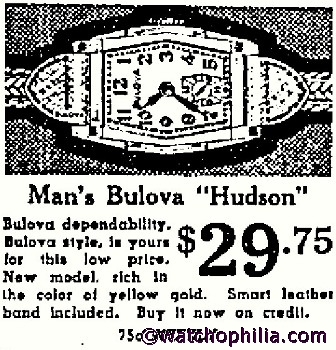 April 1936 ad. Black dialled DEWEY. 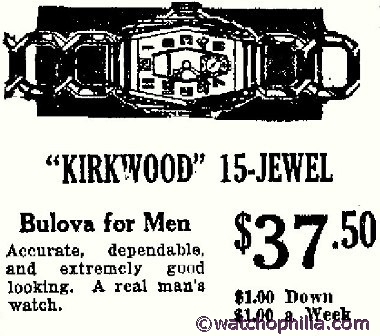 1934 Kirkwood ad. from Lisa. Here's another ad for Kirkwood. Dec 20 1934 edition of The Gettysburg Times. Click for full ad. Sweet ad from 1932, advertising the LE mark 2. 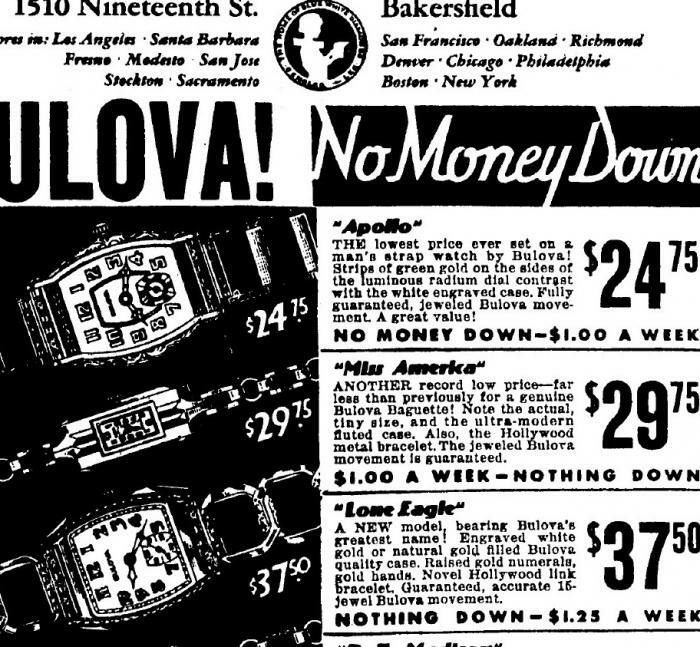 Yet ANOTHER ad for the new style Bulova Lone Eagle, this one dates to September 1933. Also has the name for the step-sided jump hour watch, the White Prince. Two fer one day! And ANOTHER ad for the new Lone Eagle model, this one is from a different city, BAKERSFIELD.Sept. 1st. EDIT:-Sorry if I did not make it clear, the ad is from the same company, but in a different part of California.